A few music apps to keep an eye on. I have a bunch of apps that I’m sitting on waiting for some updates to come. I’m sure a lot of us share this dilemma? Apps that we got and for whatever reason can’t or just won’t use them. The reasons may be arbitrary, but to each individual they are important. Still there are a few I have sitting on my iPad that I see having potential for excellence. Usually I’d just delete a high potential app that I can’t or don’t want to use. The 3 I still have installed are each something I think can be very good. Unfortunately at the moment and for reasons I’ll explain when I get to the app specifics, they are missing key elements or have flaws making them (fair or not) little more than a virtual paper weight. This is really a unusual and creative synth app. Simply put it makes sound based on a picture. You load a photo then touch and drag on it to hear the sound that VOSIS translates from the greyscale pixel data. Interesting no? It has basic synthesizer parameters like ADSR, some filtering, and so on. 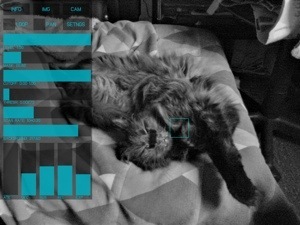 Multi touch, reverb, image adjustments relative to the sonic properties, cutoff, and other parameters are included to bring photos (and live video!) to audible life. 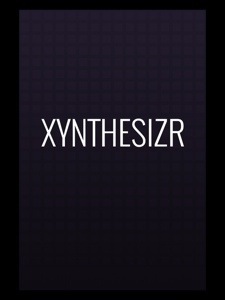 This innovative and just damn interesting synth is sitting highest on my list of potentially great apps. It could use some stability improvement, LFOs, and allow deeper routing parameters to modulate things. Basically I’m saying I’d like to see more traditional synth tools added for more control over the sound. It supports Audiobus now which is a big move forward. I’d also really like to see IAA input supported. All in all VOSIS is already capable of doing some cool things. Almost there. Mr. Turov sent me a copy of this app a while ago. I was a bit preoccupied and couldn’t get to it when I had hoped to. I wish I had though. 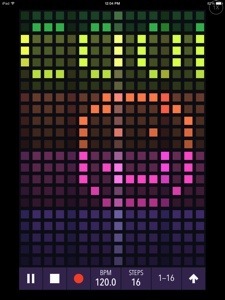 This oddly spelled app is a sleek 32 step matrix sequencer, synthesizer with generative properties. Highly musical and strait forward in design. 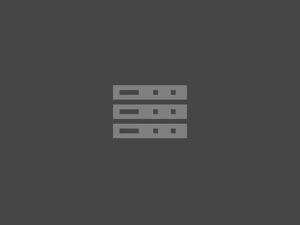 This iPhone only app (works but not native to iPad) is easy to use and instantly pleasing. It has most of what one might need to quickly tap or draw out some beautiful melodies. It has a 32 bit float sound engine, MIDI, AudioCopy/Paste and support for AudioShare, SoundCloud, email, and iTunes File Share. Its a stronger app than what I had initially expected. The developer is very attentive and clearly eager to make this something everybody will want to use. Although it has Audiobus support its missing IAA support. It also only can be used in portrait mode. Add supports for those, allow landscape orientation and make it iPad native so it can fit in more common iOS workflows would do the trick for me. Fingers crossed. This is an ambitious new iDAW that by looking at its specs appears to be what a lot of folks are looking for. 16 Stereo tracks, automation, numerous effects, sequencing, editing, and mastering tools. Its also packed with a bunch of built in instruments. Synths, drums, sound FX, and emulated instruments. It’s got a lot of good things going for it. Edit by piano roll, score, drum, audio etc. Comprehensive MIDI support, ACP, iTunes File Share and the list of features goes on looking quite impressive. But…..
…..MTS regarding routing IAA input apps suffers from one of the worst workflow designs I’ve ever had the displeasure of trying to use. It supports IAA but not Audiobus. Could be a big deal for those without iOS7. The way routing IAA instruments is done here just doesn’t make any sense. No problem with routing IAA Effects though. 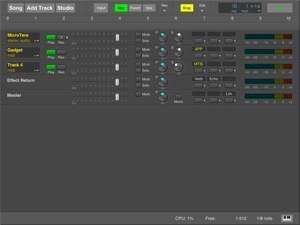 For some reason its designed so you must create a MIDI track in order to be able to select any IAA audio instrument. This is far from intuitive and it doesn’t always work as expected. Several times I followed the instructions so I could get an IAA instrument to connect with MTS and all I got were the apps internal (MTSi) instruments. What the f…. ? So frustrating! I tried and tried to find a comfort zone with this app so I could start recording and seriously explore this app, but the routing is so frustrating I just stopped. I’m not exactly a rookie here, I know how to operate DAWs. I have all the iOS DAWs and none of them are this painful. It’s very difficult to appreciate this app when just getting started succeeds only in causing fits of rage. Its a real shame too. It looks like it can do most of what I want it to. Until the workflow is redesigned to be legitimately intuitive I just can’t say whether this is good or bad? So it will sit in my “Potential” folder until that day comes when MTS is a pleasure to use rather than a sources of frustration. That potential is surely there. One to watch out for. These are just a few that I think have potential. Obviously its subjective and you very likely have some of your own. I’d be curious to hear from you, so leave a comment sharing your thoughts about another app you think this way about.